Erin Weaver brings a muscular quality to her Juliet. In her performance, in tandem with Michael Goldsmith's Romeo, it is the girl who is the aggressor. Erin Weaver as Juliet and Michael Goldsmith as Romeo in the Folger production. Photo by Teresa Wood, Folger Theatre. In the press material accompanying opening night of this Romeo and Juliet at the Folger Theatre, director Aaron Posner lauds the play's rich story and poetry. "My primary goal is to help audiences experience the play as if for the very first time," he says in the release. He succeeds, sort of, for though I've now seen 21 stage productions of this play, I did feel I was seeing it for the first time—but not "as if," as Posner contends. It was more like "WTF?" so much did he deviate from the text. For instance, the opening brawl is presented as voice-over during Chorus's prologue. Tybalt has a heated exchange with Capulet while Mercutio is dying. Capulet then seconds his nephew in Tybalt's fight with Romeo. Lady Montague poisons her wine as Romeo in Mantua learns of Juliet's supposed death. Then there were all the ghosts appearing on the upper tier of Meghan Raham's spare, metal set during the decimated final act. Posner, one of the most creative directors on the D.C. theater scene, can be exasperating in the way he mingles scenes and interpolates his own visual imagery into Shakespeare's action. In this production, his penchant for overlapping the dialogues of adjoining scenes is getting to be a more tiresome gimmick than Brian De Palma's split-screen narratives. He also seems to get bored with his Shakespeare productions by the time he gets to the final scenes, which are generally rushed and overburdened with lazy stage business. Nevertheless, Posner knows how to cast plays, and he inspires great performances out of his actors. They in turn reveal new insights into their characters. That quality in this production answers my wife who, at the intermission, asked me, "What separates what we just watched from what we saw yesterday?" comparing this production to the Shakespeare abomination that is the Carlo Carlei film version of Romeo and Juliet. That Posner and the Folger should even be in such a comparison is evidence of this production's precarious footing. In his program notes, Posner relates Romeo and Juliet's timeless popularity to the ongoing endemic violence in our own society, such as the Newtown, Connecticut, shootings, and our unwillingness to end the violence. "So, which world, we find ourselves wondering, is actually a more difficult or more dangerous place to live? Shakespeare's Verona, or our America?" he writes. He and costume designer Laree Lentz dress their fair Verona as a blend of Renaissance-era Italy and across-20th century rural Cornish society. Capulet wears an embroidered Italian cloak and farmer's boots, Lady Capulet is in a sumptuous red gown, and Tybalt, in drab jacket and shin-length loose-fitting pants, looks like he just finished his chores and is heading for the pub. Juliet starts off wearing an oversized man's jacket (perhaps her dad's or Tybalt's hand-me-down) or baggy pajamas. For her marriage ceremony she wears a slim lace dress over black leotard, and she is laid to rest in an almost-regal riding coat. Erin Weaver brings a muscular quality to her Juliet. In her performance, in tandem with Michael Goldsmith's Romeo, it is the girl who is the aggressor. She precipitates the first meeting with Romeo and, true to the text, she initiates the path to marriage. She comes onto the balcony holding a plush toy as she meditates dreamily on Romeo's name, but when she realizes Romeo is there below, she tosses the doll away and becomes all woman. In line count, Juliet dominates the balcony scene, and in this production that apportionment represents their respective personalities: she, the reading romantic, takes the lead; he, the notebook-scribbling dreamer, reacts. Goldsmith's Romeo finds himself in a series of similar acquiescing relationships: with Mercutio, with Friar Laurence, with Benvolio and, through Benvolio, with Rosaline. Even his ending up in the Capulet garden and his fight with Tybalt seem to evolve as happenstance. Not until Juliet's supposed death does he turn determined and become the aggressor—albeit, against his own self. Juliet, like any teen-age girl, has a complicated relationship with her parents. She enjoys horsing around with her father, but is also exasperated by the demands both parents place on her. When her mother broaches the topic of marriage, Weaver exhibits Juliet's rebellious spirit with the emphasis she lays on the last word of her response: "It is an honor that I dream not of." At one point she issues a middle finger salute to her mother's back. After being accosted by Paris in Friar Laurence's cell, Weaver delivers the line "O, shut the door" so peremptorily it draws a laugh from the audience. And Weaver's Juliet is more than ready to stab herself in this scene with Friar Laurence—but she hesitates doing so at the end when nobody is around to stop her. The Capulets are a Cornish-Veronese Tony and Carmella Soprano. Shannon Koob plays Lady Capulet as a wealthy wife devoted to her family until it becomes too uncomfortable. Brian Dykstra plays Lord Capulet as gregarious and protective of his family, but a thug nonetheless. When Capulet waylays Tybalt (an antsy Rex Daugherty, aggressively loyal to his family name) from attacking Romeo at the masque, Dykstra uses a winking inflection as he says, "I would not for the wealth of all this town here in my house do him disparagement." Wait until you are not in my house, he's clearly saying, and we'll rid ourselves of this little problem. Sherri L. Edelen uses inflection and nuance to give Nurse an intriguing reading, too. She is ever aware of her place as an employee in the great (but dangerous) Capulet household, but she also has a genuinely close relationship with Juliet—clearly, Nurse is Juliet's surrogate mother in this production. When Lady Capulet tells Juliet of Paris's interest in courting her, Nurse starts off exclaiming, "A man, young lady! Lady, such a man as all the world"—and with the dash here in the text, Edelen changes to a satirical tone as she continues—"Why, he's a man of wax." That tone continues when she picks up on Lady Capulet's contention that "Verona's summer hath not such a flower." "Nay," says Nurse, "he's a flower, in faith, a very flower," and her disparaging manner is obvious to us and to Juliet. Such moments are vitally important in the character arc Edelen pursues with Nurse, who is constantly looking out for Juliet's best interest. When she offers the advice that Juliet should marry Paris (Joe Mallon) though she's already married to Romeo, Edelen's Nurse homes in on Juliet's suddenly distancing tone, so that when Juliet then says she will go to Friar Laurence "To make confession and to be absolved," Nurse seems to see right through her. "This is wisely done," Nurse says reassuringly; but her manner indicates to us if not to Juliet that it's not so much the absolution that's wisely done but consulting the friar—Nurse is confident he'll work something out. The inimitable Eric Hissom plays Friar Laurence, and as with any Hissom performance this one is pure virtuosity. He slyly pulls out of Shakespeare's text a most appropriate condition for his friar: he's a stoner, partaking of "baleful weeds and precious-juiced flowers" and the "true qualities" in plants, herbs, and stones. With this Nurse, especially, but also with this Lord and Lady Capulet and Friar Laurence, too, we are all set for a most interesting take on their discovery of the supposedly dead Juliet. But we don't get that. Posner cuts out the scene altogether, jumping from Juliet drinking the potion to Romeo describing his dream in Mantua. The "Oh, woe!" scene can come off as simply silly for a less-than-talented cast and a director who is too frightened to play it either for laughs or in all seriousness and can't find the tightrope path in between. This cast, however, has the talent, but this director prefers to impose his own path. Cutting that scene and the opening brawl—the actors shout the lines of the brawl in the middle of Chorus's speech (Hissom also plays Chorus, the Prince, and the Apothecary, too)—can be excused on the grounds that they are difficult scenes to stage effectively. However, adding a scene in which Tybalt reports to his Uncle Capulet his stabbing of Mercutio—and Capulet sends him back to face Romeo—is more than an unnecessary intrusion in Shakespeare's text because all of this miming action is happening on the upper stage even as Mercutio is suffering a heart-wrenching death on the lower stage. Brad Koed is a bonhomie Mercutio, brash but not too much so, more carefree than delinquent, and he gives a haunting performance when his Mercutio is "peppered." The Tybalt-Capulet activity above is felony larceny, robbing Koed of his moment as an actor and depriving us of our vested interest in this man's tragic demise. Instead, we are wondering what the heck is going on up there, a confusion topped when Capulet then follows Tybalt back to the main stage and stands, knife drawn, hiding behind a pillar. Is he planning to kill Romeo? 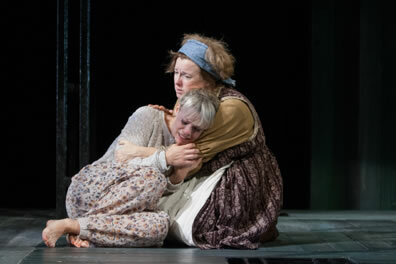 Juliet (Erin Weaver) in the arms of Nurse (Sherri L. Edelen) bemoans her parents' insistance that she is to marry Paris against her will, let alone she's already secretly married to Romeo. Edelen's Nurse has proven the real mother to Juliet, though their bond is about to break. Photo by Teresa Wood, Folger Theatre. This attention-dividing device becomes a mainstay for the play's last act. As Shakespeare's final scenes play out on the stage below, first Tybalt then Mercutio come out on the upper level and watch the action. Soon, Lady Montague (Michele Osherow) joins them after we've seen her drink the poisoned wine. So, when Romeo kills Paris offstage (we can hear the fight), we spend the entirety of Romeo's last scene watching for Paris to appear above. He finally does when Romeo dies. The point? I have no idea. I just know it diminishes what Posner himself calls the "richness in the story and so much poetry in the language." The final scene, the lovers lying dead on the stage (no, they don't depart and enter above with the rest of the ghosts), skips over the conciliation of Montague and Capulet, and everybody, living and dead, turns and stares accusingly at the audience. The message is that we are responsible, for Newtown, for Navy Yard, for Sparks, Nevada, and for Romeo and Juliet, too. Not so fast. On this very stage in 2005, PJ Paparelli staged a post-Columbine Romeo and Juliet in which the sins of the fathers pass to the sons and on down to their young teen protégés, a generational spiral of socially-condoned violence. With Posner's Romeo and Juliet, the violence seems to be a matter of individual personalities and choice. His own production seems to have missed the point he was wanting to make.